The IT Department aims to provide a broad and balanced ICT curriculum, providing experience within and beyond the parameters listed in the National Curriculum requirements. Develop in the learners an understanding of the social; economic and ethical issues arising from ICT use. To promote the subject of ICT within the school at all key stages. Enable pupils through effective Teaching & Learning to discover their full potential. To encourage pupils to take responsibility for their own learning within a stimulating and challenging environment. Encourage students to work both collaboratively (in pairs or as part of larger groups) and independently as required, and to show respect for the ideas, different capabilities and different backgrounds of all of the members of a class or group. Encourage students to review/ evaluate their own work and progress. From Year 8 pupils work towards using ICT as a Cross-Curricular skill. 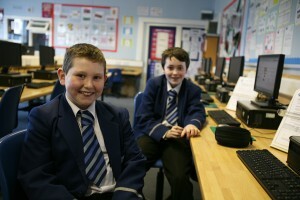 Pupils take part in the KS3 ICT Accreditation Scheme in Year 10. Year 8: Pupils have two discrete periods of IT. Year 9: Pupils have one discrete periods of IT. Year 10: Pupils have two discrete periods of IT. Year 11: Pupils have two periods each week. Year 12: Pupils have two periods each week. Controlled Assessment: is worth 60% of the course. This is completed in class under teacher supervision. End of terminal theory paper is worth 40% of the course. This is a 1-hour long written paper. Controlled Assessment is completed during Year11 over the two periods each week with entry for summer moderation. Theory is completed in Year 12. Course is taught over eight periods each week. AS: two coursework units; one practical exam unit. A2: two coursework units; one exam unit. Candidates are entered for exam units in January series of each year. Coursework is submitted for May Series of each year. IT Club takes place each lunch time in IT3 from Monday to Friday.